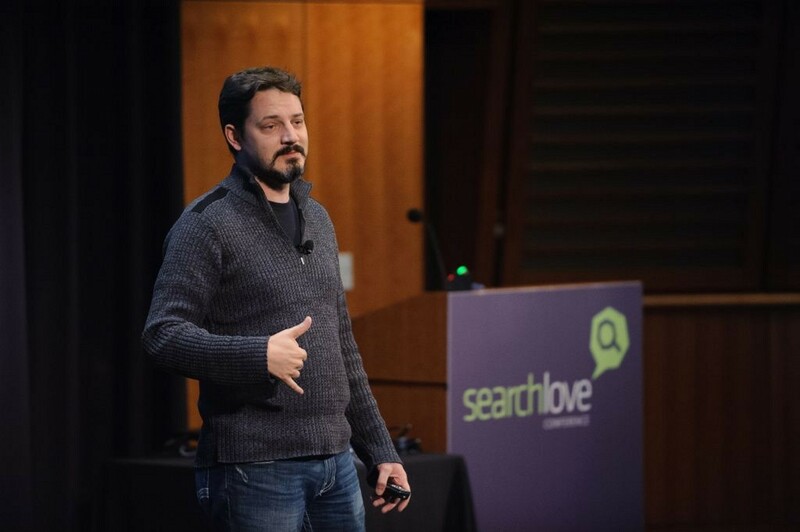 Good morning and welcome back to SearchLove Boston. Despite the general consensus that last night's after party was too awesome (read: too much alcohol), everybody is back ready for another beautiful line-up of speakers, kicking off with probably one of the best local SEO practitioner and his annual Local Search Ranking Factors study is the canonical resource on the subject. With that in mind, we are super excited for his presentation. A large proportion of this is users looking for local information. Today, we see blended search results with local results taking up most of the first page. The Venice update, introduced earlier this year, placed more emphasis on localised organic search rather than place-oriented results. So getting links is still really important. So how will these aspects play into ranking when it comes to Google+ Local? Ultimately, Google has to associate your page to a local site so Google can link your business to a site. Businesses should have a title tag and, if you are a local business, your name, address and phone contact should be listed in the HTML. Create a KML file setting the name and the locations that your business operates from. Use Geocite map generator to upload this file to your server and register in webmaster local. Schema allows you to mark up your address information and confirm to Google, yes this is where my business is located; it’s almost like a coded business card. If you’re a business operating from multiple locations, then all of your stores need to be crawlable through their individual sites, therefore, they’ll need unique page locators and be sure to submit individual locations to G+ for each of your stores. Google needs a way of ranking these localised websites and so it looks for mentions of these businesses as an indicator of popularity. Localeze, Yelp and Acxiom are the big three local providers that feed into Google. They are the three big players in local data space and they syndicate content to the smaller pages. Google crawls these pages to look for mentions, so the more you’re mentioned on these sites, the more likely you are to rank. You should note that Acxiom just upgraded. It’s probably worth getting the paid version of Localeze because this tends to make a difference. It’s also worth noting that Apple Maps is still a very small piece of the market; Acxiom, Yelp and Localeze are the big ones so make sure your business exists in all three sites. Getting niche citations can be a differentiating factor for local. Dig out any existing links from the organic side. In addition to linking to the business, they are linking to that citation which counts towards the business’ algorithm. Search for duplicates at Google Maps and report a problem (this is usually looked at within 3-7 days). If you don’t see any process, Google Mapmaker is a great tool where anyone can edit locations (think Wikipedia for locations). Google doesn’t always accept these changes, they are first reviewed by other mapmakers. Equally, make sure to clean up your data; claim existing listings, claim over old listings etc. If you’re only doing it on the live version of the sites, you need to fix the big three local aggregators first before other sites. This takes time because the speed of data updates takes about three months. Don’t expect results before then, especially if you have a lot of data that needs to be updated. As of late May 2012, reviews on Google+ are slightly more important than before, even if only for visual reasons. It’s important to get lots of reviews from lots of websites (e.g. Citysearch); Google is looking at these sites in local ranking algorithm. Try and get certain keywords (long tail and head) in the reviews as well as the overall sentiment. The quality of the reviews here is also important as well as the author. The more credible the author, the more credible the review and BIG reviewers matter - especially for sites like Yelp Elite Reviews (because elite reviewers are disproportionately showing up in organic results). Topsy is good if they will tweet your business but this only really works for restaurants/bakeries. Followerwonk is another great tool. Each community will have a community manager and these guys will have a specific Twitter accounts - work to find the intersection of people who follow both. Focus on building local relationships. Use Yelp to find elite reviewers on Yelp - Elite Yelpers will have their Facebook, Twitter or blog on their user profile. Create a separate channel for these individuals and develop relationships with them (DO NOT solicit them for reviews - that would ban you from Yelp). Gradually, over months, reach out to them and be casual about it. Search to find individuals on Google+ through Find People on Plus which has a custom search engine for such tasks. It’s difficult to get really good at local keyword research. You have to do keyword research by proxy (Google Suggest). Here, you can find the related searches people are doing and there may be relevant results that you can use within your own keyword list. Google Trends is the best way to do this - target by state and metro area which are regionally specific (and also get related terms). You can also use the AdWords Tool and get information by GEO proxy. Remember to keep track of all those form completions and see what terms are popping up most often. Take a look in Google Analytics at which towns are getting the most completions in sales. How many people are hitting your store location page and from which specific towns? What are your sites most popular search items in different locations? You can also sign up to be the first to assess your rankings using the Rank Tracker tool that Darren Shaw is currently working on. Look at back link explorer and look for terms that include a city name in the anchor text. Also, while exact match is going away, it is still important for competitive markets. How do you overcome Centroid Bias? Centroid Bias is bias towards businesses located in the center of town. But it’s okay, it is now about proximity to the searcher. Pay attention to outliers; look at the business that is located farthest away and still ranking to see how they show up. Look for what these businesses are doing well (e.g. number of reviews, special badges). 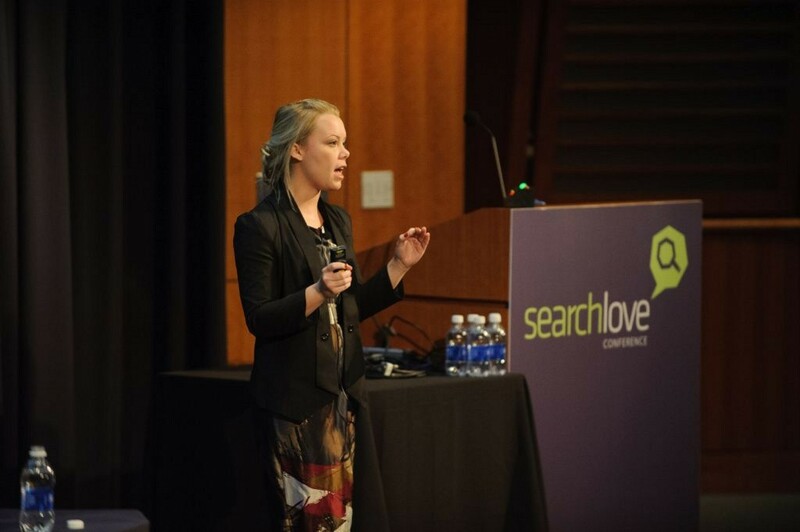 Distilled’s Head of PR, Lexi Mills talk focuses on how to leverage and integrate PR tactics for SEO benefit. 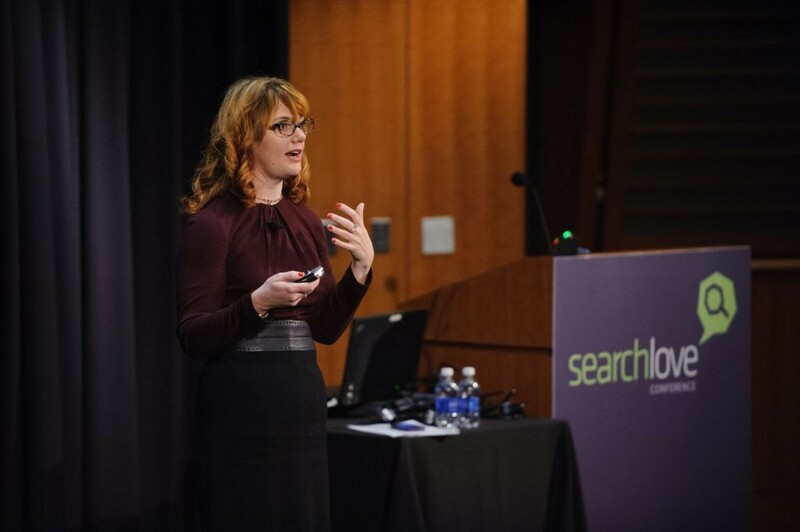 Sharing actionable insights and tips to craft and pitch content on both small and big budgets, she’s also revealing some of the exciting opportunities that PR can present for SEOs. First off making a story really fly doesn’t have to be expensive. After all, the Sci-Fi channel’s ‘pickled alien’ stunt cost them less than $800. Equally, the ideas don’t have to be new (googling old PR ideas can generate some good ideas), as long as the story is made real. For example, Twoo did some research into whether blonde's really do have more fun. The story was made real by getting an ‘expert’ to comment on the ideas. This is most easily done by calling or emailing universities and asking if someone can comment. The Twoo article also worked really well because it meant that pictures of beautiful women could be used in the article. Papers generally sell better with beautiful women on the cover, so it’s great if you can find an excuse to allow them to use the images they want to use. Make sure you refer to your domain name in your press release – you are much more likely to get links this way and it’s much easier to ask for them when it’s written in your press release. Don’t be afraid to ask the journalists to include a link in the article either. A really easy change to make is putting the geographic location in the subject of outreach emails to local media as many of them will have filters on their email inboxes. In trade media, go for the byline rather than the guest post (it’s the same as an opinion-based guest post) – use it for media, trade media and high level websites. Remember that certain publications influence other publications. If you can’t get into the publications you want, try selling to those that influence that publication. For example, certain B2B’s influence certain B2C’s and this is how Lexi once got a client in the New York Times. Make sure your research is credible; use a sample size of at least 2000, use a credible research company and use reputable sources, e.g. .gov and .edu. Try to explain findings in a way that people understand. For example, translate any statistics into relatable statistics. Lexi gave us an example of a whales heart being the same size as a Mini Cooper. You can also get leverage from current events and news. Only get leverage from events that people feel good about, don’t anchor your stories onto catastrophes. You can also use current events to capitalize on opportunities to reuse your infographics and creative pieces. 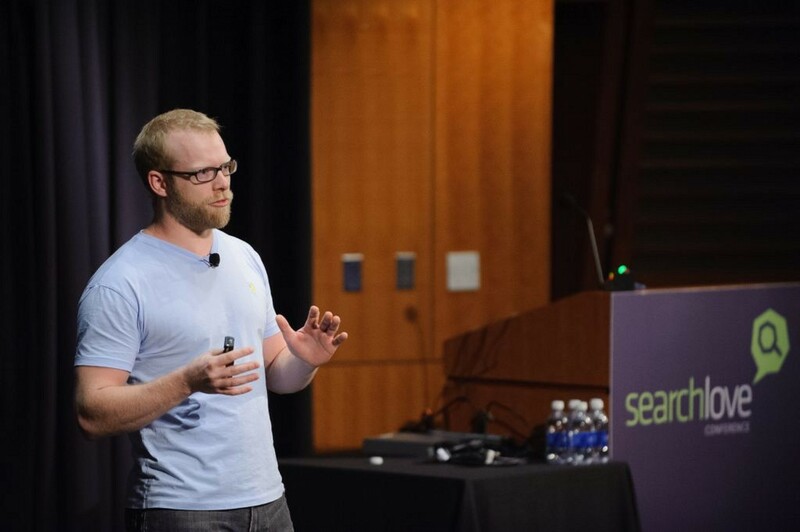 Mike King was hired by iAcquire to clean up their link building. He didn’t realise the magnitude of the paid link buying that was taking place until he conducted a quantifying outreach study (by analysing 300,000 outreach emails) literally days before he officially started at the company. His aim was to bring on more white hat clientele so iAcquire could quickly make the transition out of paid links. 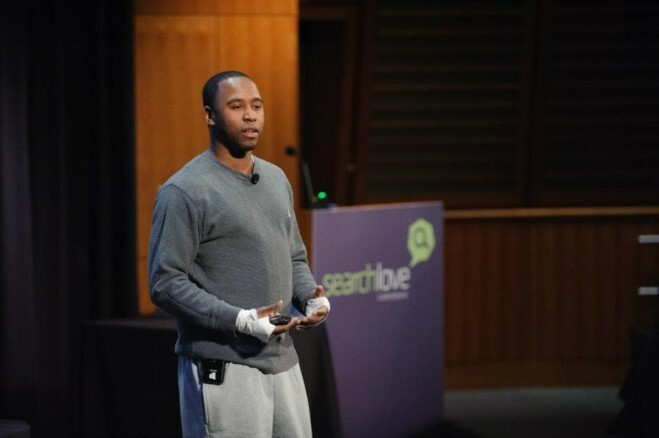 Previously at iAcquire, money was used as a motivator to form new content and link partnerships. But then they were caught by a concerned ‘netizen’ in Kansas. 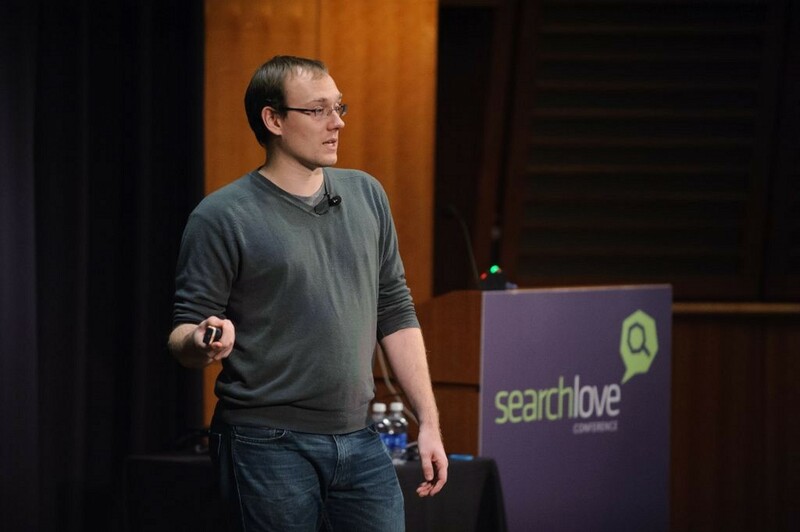 He wrote a blog post revealing iAcquire’s link building tactics; this cost the company millions. There was a massive reaction to this revelation, particularly amongst SEO gossip columns. Ironically, many of those who were rejoicing over the news are still, to this day, actively selling links themselves. "It’s time to break out of routine and try something new"
Mike’s initial reaction was to respond straight away with a very transparent explanation of what happened. However, the rest of the leadership felt differently. 8 days after deindexation, a statement from iAcquire was issued. Mike admitted that his voice was missing in the statement because he hated it, but as a team player he lived with it. The iAcquire leadership locked themselves in a conference room for a few days and emerged with a new business model. In this new model, Content Marketing became the only method; iAcquire completely stopped buying links. Around 60 days later, iAcquire was reincluded in Google’s index. However once a site has been deindexed, aren’t they supposed to stay that way? Mike explained that iAcquire was not like other companies that were forever branded as charlatans, such as BuildMyRank and Searchdex. Mike then gave other examples of agencies that have previously been de-indexed. For example, iCrossing was de-indexed sometime around 2002. After going through a series of rebranding, iCrossing has come to be regarded as one of the best digital agencies by various publications such as Advertising Age, Forrester Wave, Omma and Ad Week. There is life after deindexation. They defined their principles and what their brand stood for. Then, they took money they used to use for paid links and used it to hire writers, graphic designers, an animator and project managers and new SEO talent. They also invested in teaching people about content strategy. They maintained their client relationships and encouraged them to remain confident in their abilities to transition from paid links to free content-based links. Initially there was a disconnect between what was being communicated to clients and what was being said publicly. Google took issue with this so we aligned communication across the board. They wrote this blog post as part of their efforts to show that they were committed to no longer offering paid links. They also kept reaching out to Google throughout the process in the hope that they would notice their commitment to change. Ultimately, on July 23rd 2012, iAcquire pages started to trickle back into the index. By focusing on rebuilding their brand image, conversations surrounding iAcquire across various channels improved by 18%. The number of positive results in the SERP improved. The original concerned ‘netizen’ updated his post highlighting the changes in iAcquire’s approach to SEO. Sales and retention even improved. Make sure you have a crisis content strategy. Remember: no brand is completely immune to a meltdown. You should always have a plan for crisis content strategy that’s ready to launch at any time. Know your opponent. Use this checklist to determine your risk quotient. Monitor your reputation; use Social Mention, Amplicate, Google Alerts and turn the SERP into an RSS feed: http://bit.ly/TTEb3R or use iAcquire’s new reputation tracker: http://bit.ly/SNPvxm Respond promptly and own the blame for your mistakes. Don’t lean on other brands. You must fix your reputation yourself and don’t involve other brands until you have recovered yourself. Fix problems from the inside out. It is obvious when a fix is just cosmetic. By fixing things from the root, you are insulated from most negative responses. Make news with changes made. People rarely care about the positive things you are doing, so make sure to position your change in a newsworthy light. How does this relate to design and crafting value? Spend some time figuring out what your business does that you get lost in. What is your business really good at? Use family, friend and customer feedback. What are their obligations, threats and opportunities? You need to complement at least one of these. For example, if you can help them avoid threats, then this is the area to focus on. This is achieved through the process of curation. Step 3 – Omit needless stuff. This makes your product, services and content more elegant. Step 4 – Omit needless work. Ben spent three months living in a van, where he learned you don’t need a lot of clothes but a lot of needless time was spent picking out clothes. Identify the resources that are distractions and any efforts that aren’t yielding results or investments. Also, work to identify where unnecessary time is being spent. Eliminate it all. Now. The main purpose of marketing has to be to increase the sales conversion rate. Period. This can be done through branding, social, SEO and various other techniques but the bottom line is that your marketing is measured by how it affects your sales conversion rate. Marketing is what makes you money. Do what works and then iterate. Apple is an example- their first computers worked and now they are beautiful. When you do something really well, you don’t have to worry about competitors. Identify offers valuable to your customers and design your culture to make your design obsolete every 12 months, otherwise your competitors will catch up. Check out Ben’s slides here. From using product development to get famous through to how to turbo-charge your social growth, Mat is going to share with us the lessons he learnt the hard way when building his start up, Mixcloud. First up, identify your user states - active, inactive and dead. Try to resurrect your inactive users and reduce churn. In order to do this, you need to work out where your users are coming and going and, therefore, where you need to spend the most time. New users should be gained entirely by social, not SEO. Quick hacks like trending twitter topics, large pictures on Facebook pages and working to post at one time zone for example, 5pm GMT. Don’t underestimate the need to retain your users. Retention is key, otherwise you will see an initial growth, a plateau and then a plummet as you become a fad. Aim to keep 95% of the users you have. Make sure you do some sort of data analysis; record key moments and plot charts to monitor how social behaviour changes and how this impacts retention (e.g. if someone gets more than 30 followers, their behaviour on the site starts to change). How do you retain followers? Use strong users to retain weak users; People You May Know. Mat explains that Mixcloud added 50% to their follower rate just by adding in ‘people you may know’ to their service. Send out emails 14 days after sign up - ask them to take a look at your mobile site. Get the timing of your notification emails right on Facebook. There are certain times that people will/won’t click on it. This must be done well; if you drop below 17% CTR on your notifications then Facebook will black list you. Get it right and you’ll see a great lift in engagement because this works to reminds people of the brand. For example, AppRequest approached 10,000 users who had left and then came back by being reminded on Facebook. Quick hack: use the Facebook Developers Graph API explorer to learn what mobile devices your followers are using so you know what platform to work on and have a good way to target people. Finally, don’t forget word of mouth. Users only mentions your product when you fail, they love it or they become addicted. Get them addicted. Never tell people how to do things. Instead, tell them what you need and be pleasantly surprised by their ingenuity. Use an Ad Inventory so that you know user intent before the product launch. You can also conduct a hive query by querying every single page view for user behaviour, e.g what users did on day 42 and how they observed the site. Mat advises that by using a funnel analysis you can officially shave out 10% each time. MobileMoxie CEO and Founder, Cindy has literally written the book on Mobile SEO and is perfectly positioned to guide us through the challenges of Mobile. This is the same crawlable content on the same URL (so resources are consolidated onto one page). This is less taxing on Google’s resources as otherwise they would have to crawl and index everything twice. Google needs to see the exact same content on both the desktop and the mobile site in order to determine it is a responsive design site. The problem with this method is that it means there is a lot of code on one single page, causing load time issues for mobile phones and ugly mobile pages. It could also mean the mobile page is less effective; mobile users might want different content and information, there may be different keywords you want to target on mobile phones and tablets and this would only give out one page to target all keywords. This involves separate style sheets to control how the site sees it meaning the server does all the work. Lots of companies do this for their navigation (with one style sheet set to each type of user). Yet, this is the most complicated and resource intensive solution, with fewer standard practices in existence (but make sure you pay attention to how standards are evolving). This design might be harder for Google to crawl and index, but not by much. Responsive Design Rules apply, but in the ‘varies’ HTTP Header. Usually, varies have gzip if it is compressing pages. Remember to input the user-agent in the ‘varies’ section because the experience differs based on the user-agent. This method is the most taxing on Google’s resources. Separate mobile pages are the easiest method for targeting mobile-specific keywords because not all content needs to be mobilized. Mobile site structure and SEO elements can mimic the desktop or it can be different. Google will pull mobile results based on desktop rankings. When it comes to HTTP Header ‘vary’, the content changes based on the user agent. If a desktop accesses mobile when you have user agent redirection and detection on the page, you have to set it up based on user-agent in the HTTP Header. Make sure there is only one URL for separate mobile sites - trailing slashes and normalization. Remember to send updated feeds to mobilization engine to include SEO. Todd is more commonly known as Oilman, and he has worked in the SEO industry since 1998 . He’s seen first hand how the algorithm has changed over the years. In his session today Todd talks through how to deal with being hit by penguin. Ultimately, if you’ve been hit by Penguin, you should have seen it coming but how should you react to the update? Don’t submit a reconsideration request immediately. This will just put you in Google’s spotlight. Instead, start researching the links using Lindex, Majestic SEO, Ahrefs, and Open Site Explorer. Lindex takes majestic links and crawls them. Scrub the dead ones and re-verify then you can copy every page that the link is listed on and categorize them. You then need to organise your links, based on PA,DA, PR,Anchor text ratio, placement, age of link and eyeball quality. Scrub your links, dump networks and reach out (email/phone/whois). This is the time for true honesty. Identify duplicate content and copy scape. Make sure you track all efforts and results (this is super hard work!) For internal pages only, redirect the Penguin URL to a new URL (this is the difference between a page level penalty and a domain level penalty). Use a 301 but do so at your own risk. Submitting a reconsideration request should be done as a last resort. When submitting a request, it should be based on full disclosure and full documentation. You, therefore, need to include a full list of links, methods of contact, dates of outreach and successful removals (as well as which ones weren’t successful). This takes a very long time to put together so a reconsideration request really should be a last resort. If there were enough quality links, site wide links just don’t matter. 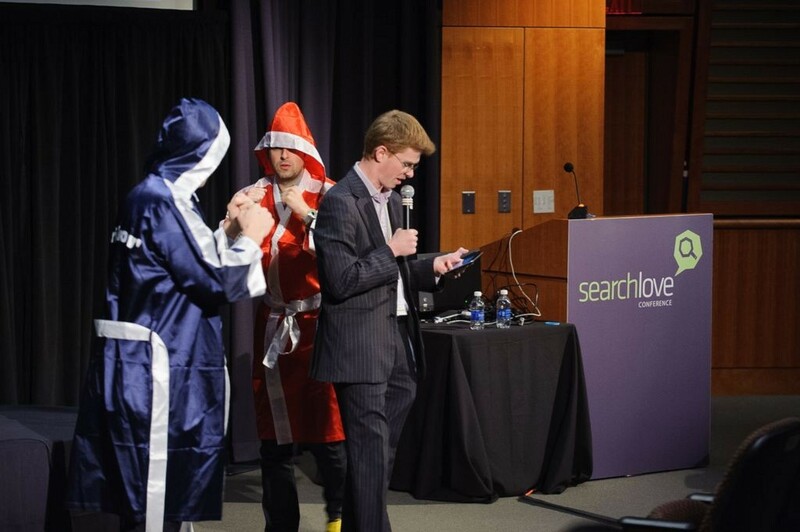 In the SearchLove Boston grand finale, Will and Rand went head-to-head once more. It was round two in the debate on great marketing on a small budget. 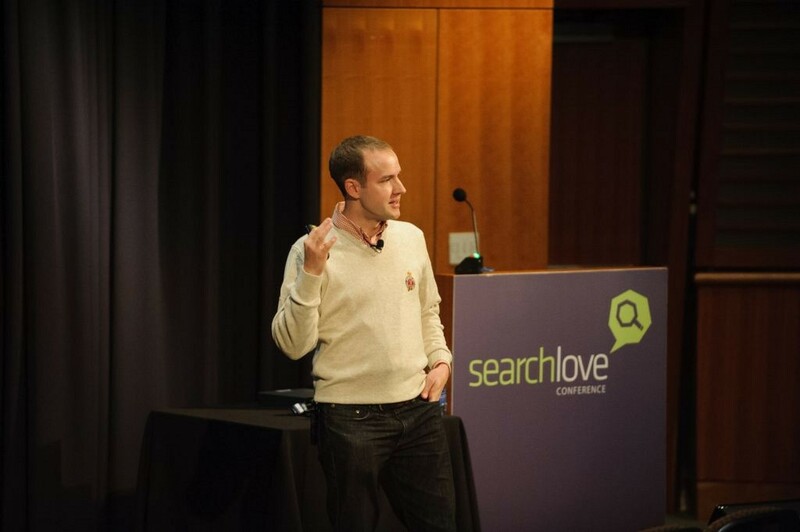 Read about the original ‘clash of the titans’ that took place at SearchLove London here. We recommend you put the Rocky theme tune on in the background as you read this. And that concludes SearchLove Boston 2012. We hope you enjoyed it as much as we did, and that you found it truly valuable. Let us know what you thought! P.s. The official photographer for the conference was David Zwickerhill. You can view more photos from the conference here.